Android Provides multiple ways for different apps to communicate amongst themselves on the platform. An Android app can share data with other apps that can be used by other apps to build their own logic around. To give an example, you might need to query contact details on the phone. In Android the recommended way to share data is through content providers. A content provider is an owner of particular content, it provides well defined APIs to read, insert, update and delete that data. The content provider can internally use any place to store its data like a local file, local database or some remote service. In this article we are going to learn how we can create our own content provider and access the data from an another app. Find the final project on GitHub. We will start by creating a Content provider class in our application which can hold image metadata items. We will use a local SQLite database to store the data, but you can use any where you like to store the data. First create an ImagesProvider class extending ContentProvider class and overriding the following methods. In the above code we created an ImagesProvider class which overrides the necessary methods to create a Content provider. We will start by implementing the getType method. The getType method returns the Mime type of the data as a string. The above class extends the SQLiteOpenHelper and creates a table called 'imagestore' in the 'ImagesDatabase.db' database with the columns 'id', IMAGETITLE, 'IMAGEURL' and 'IMAGEDESC'. The getImages function queries on this database using the SQLiteQueryBuilder class and returns the result cursor. Now let's implement the onCreate and query functions in our content provider. //Query is for one single image. Get the ID from the URI. In onCreate function, we create an object of the ImageDatabase class and pass it the context. We store this variable so that we can use it for various operations of our content provider. In the query function, we check if the query is for one id. In this case we fetch the id and if not, we keep it as null and pass those values to ImageDatabase:getImages to fetch images data and return the result cursor. //Delete is for one single image. Get the ID from the URI. //Update is for one single image. Get the ID from the URI. In the above code, if the URI is for a simple image we get the id value, otherwise we keep the id as null. Then pass that value to the appropriate corresponding function in ImageDataBase class. 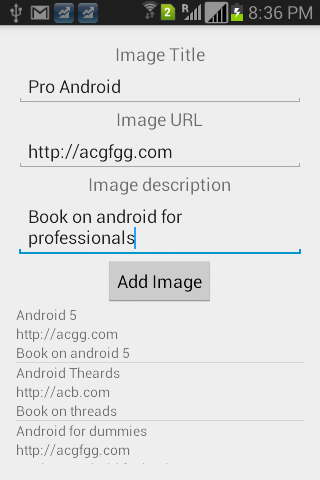 We need to declare our content provider in the AndroidManifest.xml file using the provide tag. In the above <provider> tag the android:name property should be the Content Provider class and android:authorities should be the URI to identify the content. Once the above is complete, we are ready to test our content provider. To do this, we will create a test app in the current Main Activity, again changing to appropriate values for your application name. In the above code, the onCreate function fetches all the contents from the content provider using the CursorLoader function and passes the CONTENT_URI to it. The Content provider in Android provides a clean and systematic way for apps to share and use data from other apps. It standardizes how content is shared and consumed by multiple apps. Many inbuilt content providers exist in Android and the API makes it easy to write your own custom content provider or use custom content providers. Have fun creating your next content provider and let me know if you have any feedback.